Somewhere along the Costa del Sol. We left Ceuta mid-morning and headed back north, again crossing the strait of Gibraltar. It was blowing a stiff westerly and seas were rough. There is a strong current passing through here, which we did account for, although we didn't think it all the way through. You see, the current was going east, and we wanted to cross it more or less northwards. This meant pointing the nose of the boat towards northwest to offset the leeway. That way we made way north, where we wanted to go. So far that's all quite normal sailing stuff, but the current in parts of the strait was so strong that we had to point very westerly to keep to our intended track. This meant our nose was now pointing too far upwind to make good speed! Luckily it wasn't very far to go, so we just headed off our planned track and let the water carry us further east so that we could get a better angle on the wind and keep sailing. As soon as we got in the wind shadow behind the massive rock of Gibraltar, the seas calmed down a lot and the current weakened considerably. The rock also blocked most of the wind, so we went from rough seas and 30-40 knots to a very pleasant 15-20 knots in flat waters - what a welcome difference! We dropped anchor just outside the marina in Duquesa and spent a only slightly rolly (but free) night there. 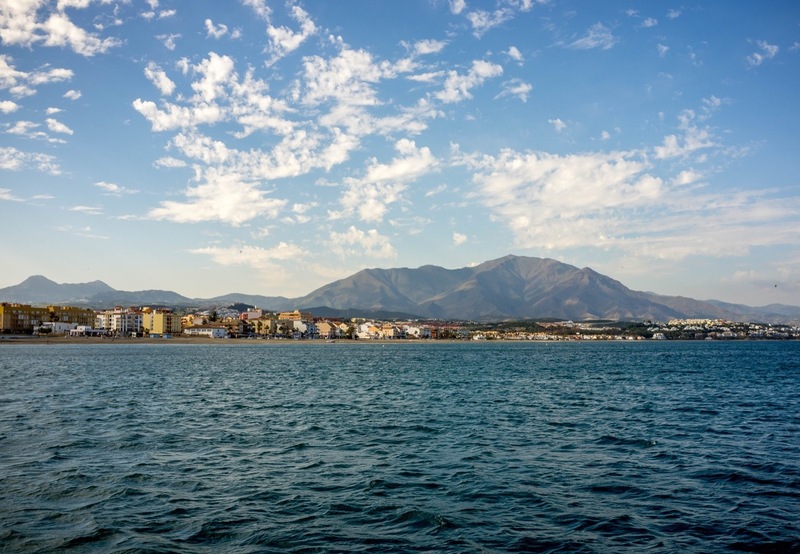 The next day the wind turned out to be much lighter, and we motorsailed further along the coast into Fuengirola, where we berthed bows-in, remembering our lesson from Ceuta. The wind along the coast was kicking up a swell and the flat shoreline offers virtually no anchorages - and the marinas are expensive here. 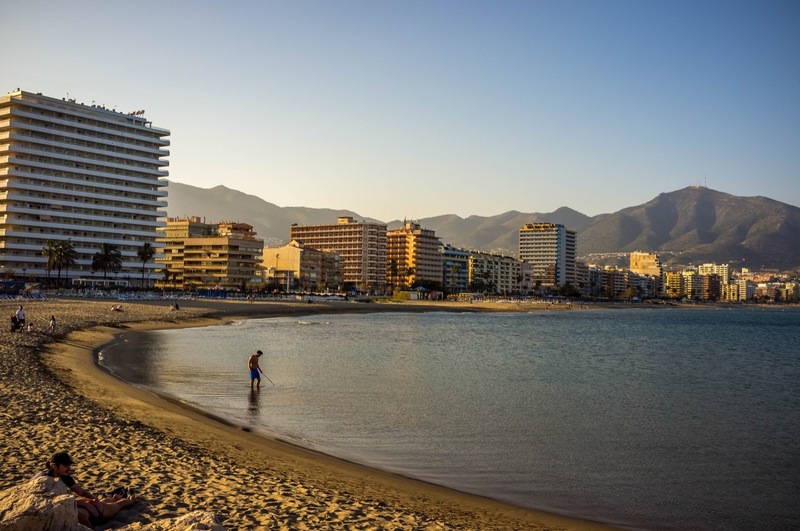 The entire Costa del Sol (sunny coast) is a tourism hotspot and has little to offer for cruising sailors like us. 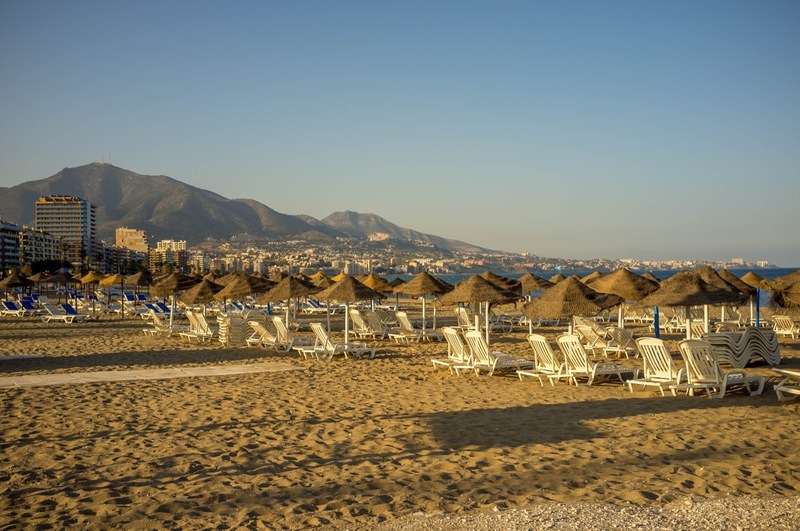 Fuengirola was simply one highrise hotel block after another, the beaches cluttered with rental loungers and parasols, the sand greasy with sunscreen. We walked through town, but it was just more of the same, complete with Burger King and Starbucks. One night here was more than enough. Rental loungers, €12 a day. Drinks not included. The wind forecast was way off again, as often in this area. 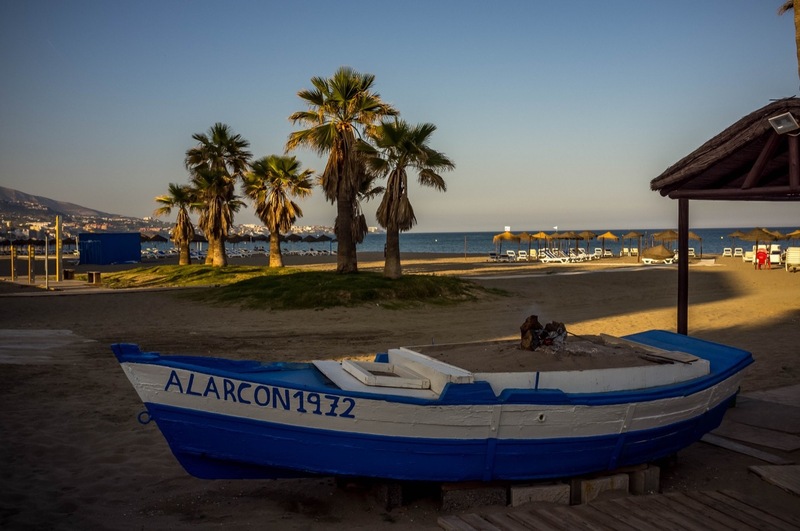 The next hop was a place called Caleta de Velez. Slightly smaller hotels and a marina shared with a fishing harbour, heavily polluted with floating bottles, styrofoam containers and other garbage. The marinero was very friendly and helped us dock at the last available berth, which was a bit tricky due to the strong gusts and a sharp concrete corner armed with a rusty steel ladder, but with his help we managed to avoid embedding either of those in our hull. 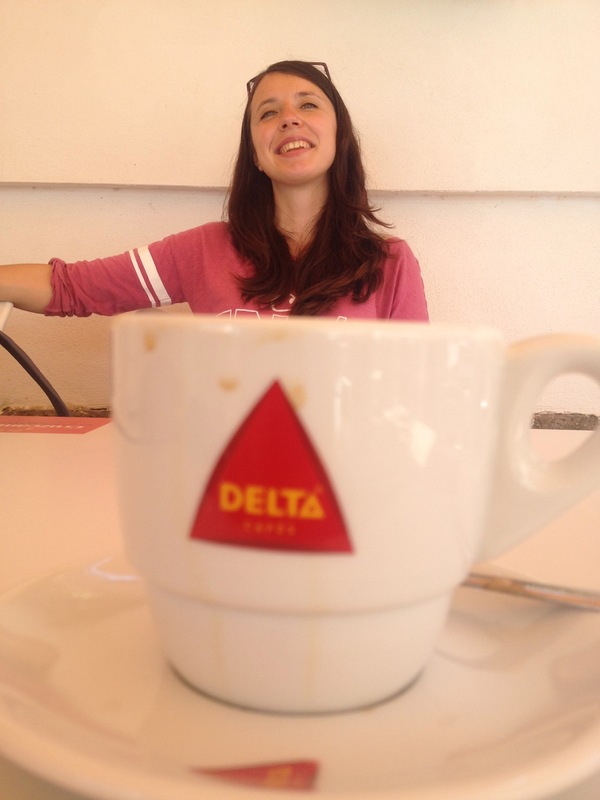 Portuguese coffee and Lithuanian woman. Both yummy. 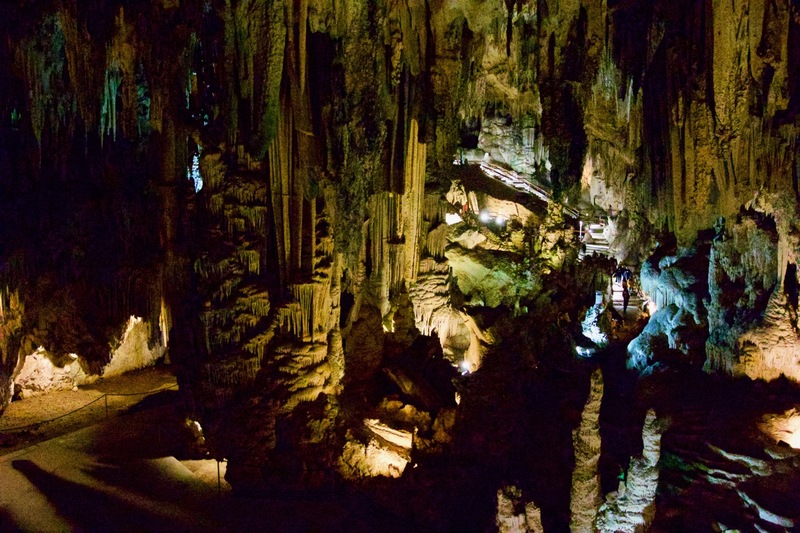 We stayed here for three nights, as even with all the mass tourism horrors, we found something cool to look at: The Cuevas de Nerja (Nerja Caves). We had to grab a bus from the marina and then walked up a hill to the caves, which were pretty crowded, but access was managed efficiently and the queue not too long. It was well worth it. 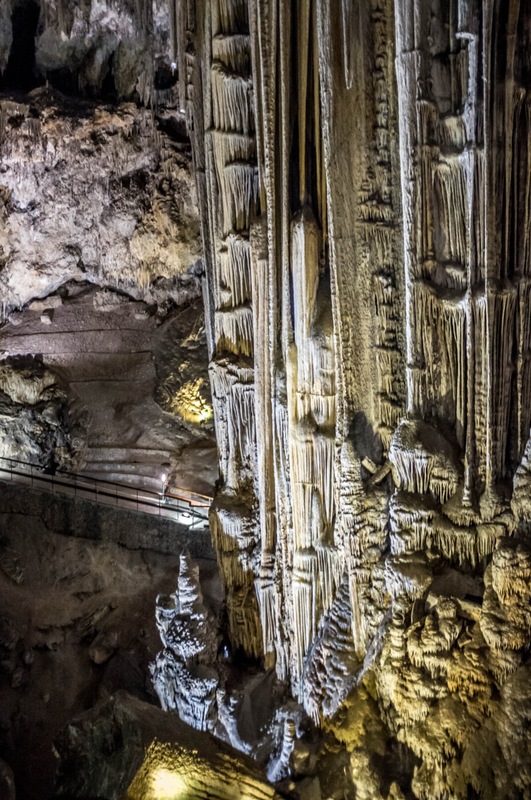 These caves were rediscovered fairly recently, in 1959, when a guy fell down a sinkhole and found this most amazing cave complex. It later turned out he wasn't the first though, Neanderthals about 42'000 years ago had left graffiti on the walls. I'm not sure if this is the biggest cave in Europe, but it sure is huge, and it probably is the most impressive one. Like any decent cave, it of course features a concert hall. We tried to photograph some of its glory, but it was tricky, as it was fairly dark, milling with people and tripods were not allowed. That's people on the stairs in the far back, to give you an idea of the scale. After the cool caves, we decided to walk into town in the sun and take the bus from there, which took us off the well trampled tourist paths and through some lovely scenery and past a local restaurant. Lots of fields span the hinterlands, as much of Europe's vegetables are grown here in Andalusia. 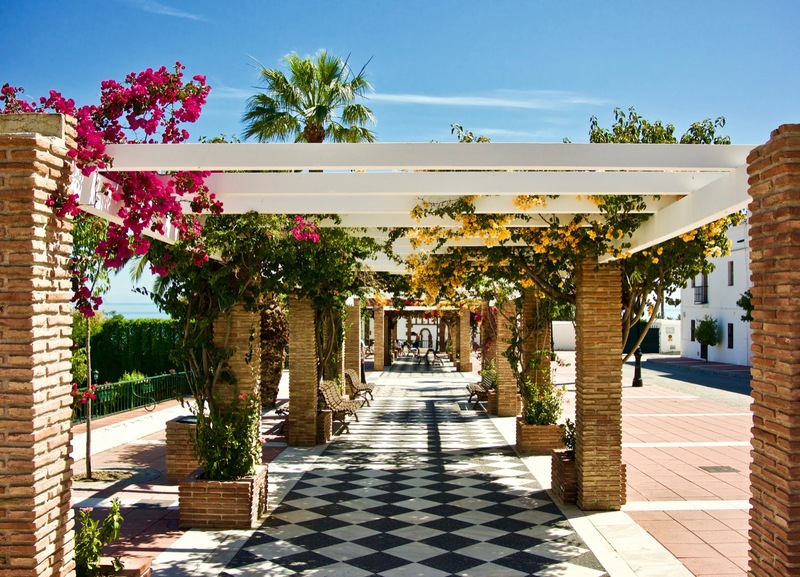 We found this beautiful spot wandering around a small village during siesta. Nerja. 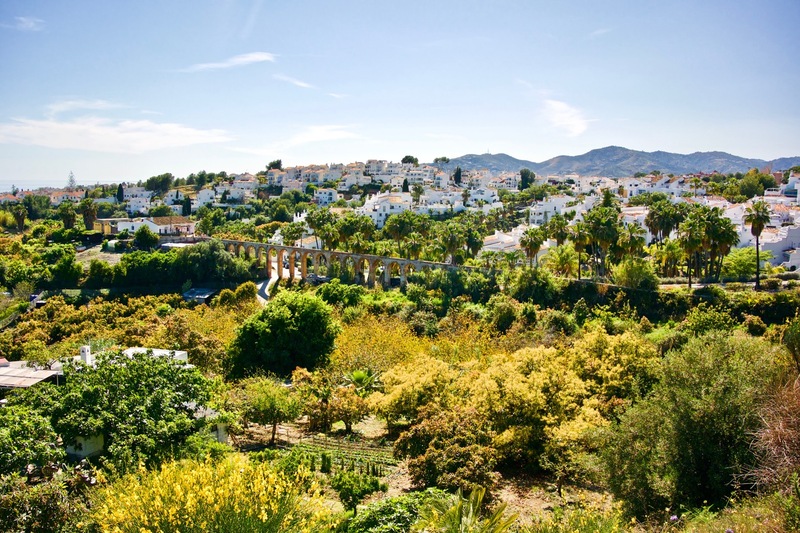 Away from the tourist hellholes, Andalusia is quite pretty.